The once narrowing footpath next to the Arun Bridge just off the Chesworth site has been repaired. 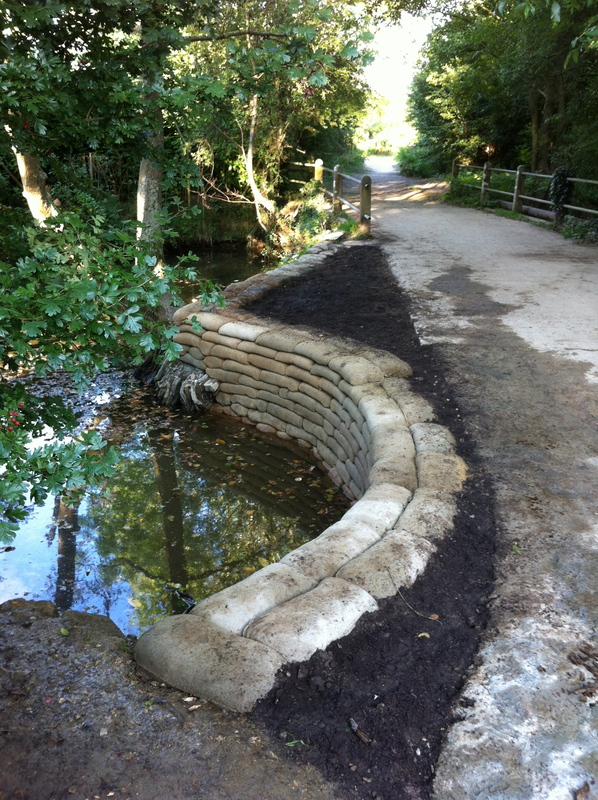 The workmen have been on site all week putting in a new supporting wall and infilling to make the path safer and to (hopefully) prevent any floodwater making things worse. I see that the side has been made up with sand bags but I thought this was going to be the dog dipping area when you do the wetland project. Very difficult for dogs to get in and out! But I think that’s what you are trying to achieve! Countryside is for everyone! Dogs need enjoyment too and somewhere to cool off on hot days. Thanks you for your comments. The repairs to the bridleway over the Arun Bridge were carried out by West Sussex County Council as the bridge is outside the HDC Chesworth Farm boundary. While the head countryside warden raised the issue of a dog splash with WSCC prior to the works, the county council’s opinion was that they had a duty to repair the bridge to ensure safety and prevent further erosion of the path so that people, dogs, cyclists and horse riders can safely use the bridleway, but that they would not be able to justify further expenditure to enable dogs to swim, as it is not a statutory requirement for them to provide. However we (the Friends of Chesworth Farm), together with the warden, have been discussing an alternative dog splash area as we appreciate this is a popular activity for many visitors’ dogs. The wetland project you mention is a joint proposal between the countryside unit at Horsham District Council and the Friends of Chesworth Farm and is completely separate from the repairs to the bridleway.